You are researcher, PhD student, postdoc, professor, assistant or simply interested by the topic? You want to know more and engage actively in providing Open Access to research results? 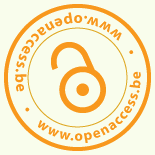 Participate in the Open Access workshops, organized by the Flemish and French-speaking universities of Belgium, at the Royal Library of Belgium in Brussels on 21-22 October 2015.
for Wednesday 21 October: coming soon (organized by the Flemish universities). for Thursday 22 October: here (organized by the French-speaking universities).